Majesticware by Sakura, designed by Sue Zipkin. This is the 10 1/2" diameter dinner plates. 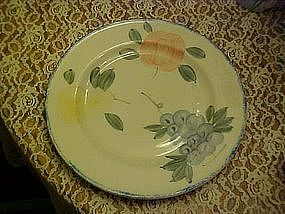 Sponge border with hand painted fruit design. Dishwasher & microwave safe genuine stoneware. All are in perfect condition. We have 8. Price is for each. I have other pieces in this pattern.